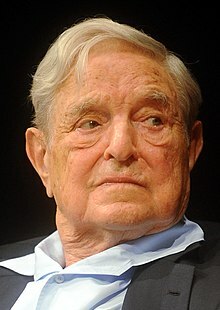 George Soros, the billionaire who as a young boy in Hungary narrowly escaped the holocaust and whose emigration to England and the United States led him to establish an enormously successful hedge fund, has been in the news a lot lately. Soros was a target of one of the pipe bombs that were shipped to multiple critics of President Trump. He remains the target of unsubstantiated claims that he has financed the migrant caravan that, to the delight of Republican political operatives, has become a symbol of rising public anxiety about uncontrolled immigration. Such notoriety is nothing new for the 88-year-old Soros. Nor is it confined to his advocacy of expansive immigration policy in the United States. In 2015, Hungarian President Viktor Orban bitterly accused Soros of attempting to undermine European nations by providing assistance to refugees fleeing the Middle East and Africa. "His name is perhaps the strongest example of those who support anything that changes the traditional European lifestyle," Orban said. Many liberal foundations — including the Carnegie Corporation, Ford Foundation, Atlantic Philanthropies, the Tides Foundation, and the MacArthur Foundation — have together donated tens of million dollars over the past decade to promote immigration policies they characterize as generously expansive and compassionately inclusive. Some have also financed campaigns by activist groups to vilify those of us who call for firm immigration limits to protect American workers and preserve social cohesion. But Soros's controversial public profile and his emergence as a leader of the liberal "resistance" to President Trump have prompted intense criticism of his immigration-related philanthropy, which he conducts through his Open Society Foundations. Much of the criticism has been unfounded in its conspiratorial excesses and blatant anti-Semitism. Some is worthy of consideration as a window into the discussion of important questions in the national immigration debate. For example: When does warm-hearted advocacy for expansive immigration and illegal immigrants shade into political opportunism and contempt for those alarmed at the resulting demographic and cultural transformation? And when do love of tradition and patriotic nationalism shade into xenophobia and white nationalism? Soros has described himself as a stateless statesman. A 1995 profile in the New Yorker said he had "the instincts of the outsider; he was distrustful of government, disdainful of the establishment, allergic to institutions generally." The magazine cited his "tendency to beatify one side and demonize the other." It described him as "an extremely undemonstrative person, who appears cold, detached, and insular." Soros, then, is not one to be impressed with the classically conservative social bonds of loyalty, custom, and mutual obligation. In his advocacy of open immigration, Soros is a post-national man, averse to sentiments of national identity and cohesion and enthusiastic about the transformative power of open borders and unrestricted immigration. Such sentiments have motivated his generosity to the highly partisan Center for American Progress (CAP), which shortly before the 2016 election, the New Republic said, "has commonly been referred to as Hillary Clinton's government-in-waiting. The CAP has been a powerful force in the steady migration of the Democratic Party toward open borders and away from its traditional concerns that well-regulated immigration was essential to the interests of working-class Americans. For me, Soros's activism brings to mind Edmund Burke's critique of revolutionaries who "are so taken up with their theories about the rights of man that they have totally forgotten his nature." One Soros grantee is the National Day Laborer Organizing Network (NDLON), which resists efforts by cities and towns to restrict hiring sites that they believe have become public nuisances. NDLON sued Redondo Beach, Calif., which had adopted an ordinance that prohibited standing on a street or highway and soliciting work from anyone in a motor vehicle. In 2011 the U.S. Court of Appeals for the Ninth Circuit ruled that the ordinance was so broadly written that it violated the constitutional guarantee of free speech. In an angry dissent that illustrated one fault line in the immigration debate, one member of the court wrote that the ordinance was a reasonable attempt to control the problem caused by men who "litter, vandalize, urinate, block the sidewalk, harass females and damage property." But NDLON pressed its case, denouncing a similar ordinance in Fairfax, Va., which it denounced as "nothing more than an ugly and xenophobic attempt to get rid of the Latinos on the sidewalk looking for work." The Open Society Foundations are active on multiple fronts against law enforcement directed against immigrants. A 2011 grant to the Immigrant Defense Project earmarked $400,000 "to protect the legal, constitutional, and human rights of immigrants with criminal arrests and convictions." Another $200,000 went "to protect the legal rights of immigrants facing deportation as a result of interactions with the criminal justice system." The Immigrant Defense Project takes a hard line against enforcement. Its director in New York declared that the U.S. deportation system is so unjust that "we cannot justify sending anyone into detention and deportation, a system that only compounds and exacerbates the unfairness that many immigrant and low-income communities have historically faced through the criminal (in)justice system." The debate over these issues is obviously of great importance. It should be open, honest, and civil. Soros and other liberal philanthropies have ensured that the expansionist forces are far better funded than those of us who take the restrictionist side. The liberal biases of most of the immigration press have ensured that unfounded efforts to demonize Soros receive far more scrutiny than do the campaigns to demonize us. I'll have more on that subject in a few days.